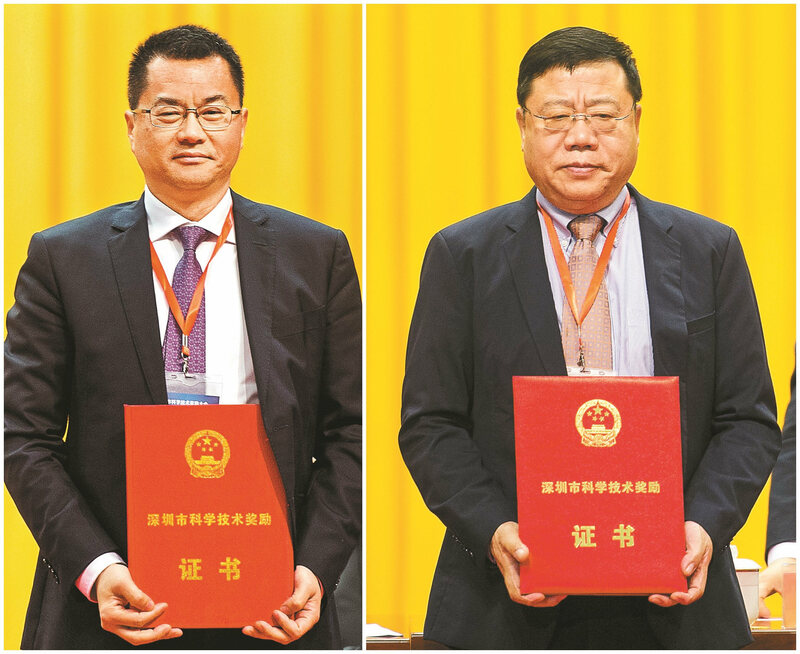 Yuan Jiancheng (L) and Yang Zhen (R) have received Shenzhen Mayor’s Awards for Science and Technology. Yang Zhen, founder of the biology and biological technology department at Peking University Shenzhen Graduate School, and Yuan Jiancheng, a scientist with Shenzhen Hanyu Pharmaceutical Shareholding Co. Ltd., have received Shenzhen Mayor’s Awards for Science and Technology. Yang is also a director with a State-level laboratory at the university based on research on tumor chemistry genomics. One research project chaired by Yang won the second prize at the 2016 national science awards. Yuan is a winner of the national science and technology invention awards. He discovered antibacterial peptide in white blood cells before joining Hanyu, which was listed on the stock market in 2011. By 2017, the company owned 12 pharmacies developed on the basis of antibacterial peptide and nine new pharmacy certificates. At the awards ceremony Wednesday, another10 projects were awarded for their natural science achievements, three projects were awarded for technological inventions and48 items were awarded for science and technology advancements. The awards cover eight sectors of the high-tech industry including electronics, pharmacy, aviation, new materials, new energy, energy conservation, advanced manufacturing and automation.